Is your organization already GDPR proof? Are you already recruiting a Data Protection Officer (DPO)? Download this Data Protection Officer Job Description now! We support you and your company by providing this GDPR Data Protection Officer Job Description template in order to simplify the process of developing a job description. It will save you and your Human Resources and your Recruitment department time, cost and efforts. 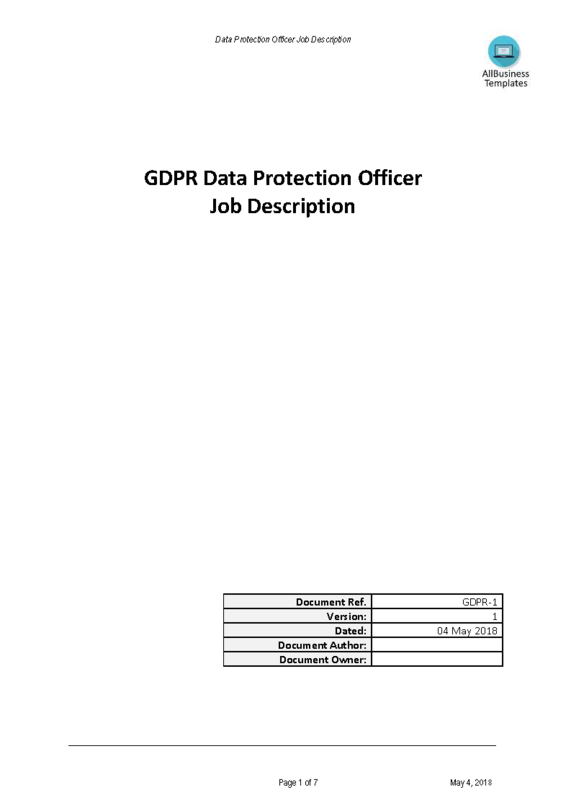 How to draft a GDPR Data Protection Officer Job Description? This GDPR Data Protection Officer Job Description has ways to grab its reader’s attention. They are crafted by HR professionals, are intelligently structured and easy-to-navigate. Pay close attention to the most downloaded HR templates that fit your needs. Download this GDPR Data Protection Officer (DPO) Job Description now or check out our fit-for-purpose GDPR Complete Compliance Kit templates here! The document(s) will be available to download immediately after purchase. Also interested in other Job description templates? Browse through our database and have instant access to hundreds of free and premium Job descriptions or other HR documents, HR forms, etc to make you more effective and efficient.